Music Director/s: A.R.Rahman, Rohan-Rohan, Vikram Montrose. 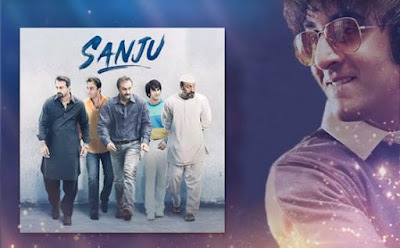 Sanju Music Review: When you have a movie coming on the life of someone like Sanjay Dutt, by default couple of genres gets decided to have songs about. An inspirational song, a song for stoners & a party song – Sanju ticks mark all the three sections. Let’s analyse whether or not the songs of Sanju are more than just being situational. Not a song that will have you from the first listen but trust me you’ll incline towards its crazy texture after multiple hearings. Gamble of adapting the retro accent gets paid off well & thankfully the song don’t cross the line being caricaturish. Sunidhi Chauhan gets the accent spot-on while Sonu Nigam tries to fit in. Puneet Sharma pens the correct words according to the mood of the song. A fun, quirky, feel-good number that will bring a smile on your face by the end. Fighting the demons of inner-self, Hirani delivers yet another gem collaborating with Sukhwinder Singh and Shreya Ghoshal. The trailer got its feel because of this song & it was very well used in the film. Vikram Montrose’s tune is catchy and Shekhar Astitwa’s lyrics scream ‘inspiration’ in every single word. A song that will linger your soul way after you leave the cinema hall. My personal favourite from the lot! This is stoners’ anthem & a trademarked A.R. Rahman poison which gets in your blood slowly. But once it’s in, it will be impossible to get it out. Irshad Kamil has written the lyrics because why not – “Badi matmaili dushman duniya, hai sabse badi uljhan duniya”. Shashwat Singh has adapted the ARR touch with perfection & Poorvi Koutish’s La-La-Laing gets you in another world. Not promoting drugs but this song is a dream destination to be in for any stoner. The song dedicated to Mr. Sutro or Mr. Source from which most of the news pieces are extracted from nowadays. Puneet Sharma, Abhijat Joshi and Rohan Gokhale, with their lyrics, have shown a mirror to the news agencies which run on speculated articles. Papon, the best choice to sing this song, has been wonderfully backed by Ranbir Kapoor & Supriya Pathak in the track. The song is a ‘full stop’ to the media thrashing that has been shown in the movie. Follow the filmography of Rajkumar Hirani & you’ll find at least one song that narrates a story in itself. Apun Jaise Tapori in Munnabhai MBBS, Samjho Ho Hi Gaya in Lage Raho Munnabhai were two such songs. Give Me Some Sunshine & Love Is A Waste Of Time come close being such songs but they’re more inclined to the melody. Baba Bolta Hain… is yet again one such song coming from a Hirani film. Why this song went unreleased? A true-blue chartbuster! Why Rajkumar Hirani didn’t gave us a chance to groove on this before the release? Yes, the song has not been featured in the movie but we at least deserved the audio. Nakash Aziz catapults the song to another level with his full-of-life vocals. Rohan-Rohan have composed the song in a way, one can imagine Ranbir Kapoor rocking & rolling throughout. Shekhar Astitwa & Rohan Gokhale have kept the words hummable; it’s something we’ve seen in Salman Khan’s chartbusters. Nikhita Gandhi will seduce you with this! A.R. Rahman makes sure along with her voice, the melody should also do its magic. But, it’s Irshad Kamil who stuff the required temptation & allurement with his words. Just a part of it was used in the film & was enough to serve its purpose. Leaving apart the seduction aspect of the song, this will not enjoy as much shelf life as other songs of the film. All said and done, Sanju is not like any other Hirani album – it has songs which not only are situational but also will be with you way after you watch the movie. The album consist of typical playlist-toppers and has everything for everyone.